With corpses filling Cairo’s streets and both sides vowing to escalate, any glimmers of revolutionary hope have been all but extinguished. Cairo at night has become a city of silence. Once among the world’s most crowded and raucous nocturnal metropolises, it is now home to ghosts, a place haunted by fear and despair. Never ones to abide by past military-imposed curfews, Egyptians stay indoors after sunset. The night is owned by helicopters roaming the skies, fat army tanks sitting heavily in the streets and bands of men wielding knives, clubs and guns at makeshift checkpoints. The occasional crackle of gunfire rings out, a reminder that the violence has only slowed, not stopped. Most of the killing is done during the day. Over 1,000 dead in three days of carnage. As a reporter covering conflicts over the years, I have seen many dead bodies—but never have I seen so many people dying before my eyes. The last gurgling gasp of air, the eyes turning lifeless, the rising wails of grief. As Egypt plunges headfirst into a deadly downward spiral with no end in sight, many of its citizens are baying for still more blood. Both sides leading the conflict, the military and the Muslim Brotherhood, are playing a zero-sum game, based on a false binary demanding that Egyptians choose one or the other. Both are defined by hierarchy, patriarchy, secrecy, mendacity and a blinding sense of their own superiority. Both are juggernauts in the Egyptian body politic that have heedlessly clawed away at Egypt’s social fabric in their struggle for power, proving time and again that their own political and economic interests trump all. In meting out violence, the military and security apparatus has an overwhelming advantage, and its forces have done so with unflinching brutality. The storming of the sit-ins supporting deposed president Mohammed Morsi on August 14 marked the bloodiest day in Egypt’s modern history, with more than 800 dead. Cairo was inundated with corpses. In the al-Iman mosque the day after the raids, more than 230 bodies lay on the floor. The smell of death hung heavy in the summer heat, as family members placed blocks of ice on the bloodied shrouds to try to stave off the decay. 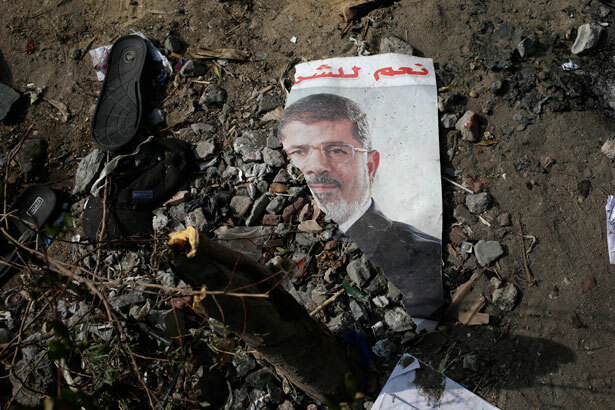 Many of the bodies were charred beyond recognition, blackened by the fire that burned down the field hospital and the Rabaa al-Adeweya mosque, the epicenter for Morsi’s supporters over the past six weeks. Justifying the crackdown, the government and police repeatedly assured Egyptians and the rest of the world that, in fact, they had acted with the utmost self-restraint. “Terrorism” was the word repeatedly used, with Army spokesman Ahmed Ali succinctly summarizing the state’s logic of violence. “When dealing with terrorism,” he said, “the consideration of civil and human rights are not applicable.” The military-backed cabinet, the security establishment and the allied so-called “liberal” elite have vilified an entire swathe of society as violent extremists unfit for political life. Those who don’t toe the line are demonized. Mohamed ElBaradei, the Nobel peace laureate who resigned as vice president of international affairs in protest of the violent storming of the sit-ins, has been subjected to a merciless defamation campaign. One popular cartoon shows him stabbing Egypt, depicted as a woman, in the back. On Sunday, August 18, he boarded a plane to Austria, declining to give interviews about the reasons for his departure. Within Egypt, local media have helped whip up chauvinistic nationalism and a wave of state worship that has gripped the country. Millions of Egyptians have run headlong into the arms of the military and the police state to oust Morsi and his ilk, seeking a security blanket that is really a straightjacket. As it stands now, much of Egypt is now under a month-long state of emergency and a nighttime curfew. The interior ministry has granted itself the authority to use live ammunition against anyone who assaults police or state institutions. Among those who have survived the bloodshed, more than 1,000 Islamists have been arrested and much of their leadership jailed. The prime minister has proposed disbanding the Muslim Brotherhood—or what is left of it—altogether. Morsi’s supporters have engaged in violence of their own, killing civilians and security officials, attacking government institutions and sparking a low-level insurgency in Sinai. The security establishment appears to welcome the escalation, intentionally provoking the Islamists to adopt even more hardline tactics and commit more violence, in a bid to justify further repression and forever push them outside of politics. Egypt’s largely helpless Christian population, meanwhile, is being forced to pay the price for the state’s brutality against the Islamists. For months the Brotherhood and its allies have used divisive religious rhetoric to further their political goals, a trend that reached new heights following Morsi’s ouster, with sectarian vitriol frequently emanating from the stage at Rabaa. After the sit-ins were forcibly dispersed, dozens of Christian churches, monasteries, schools and facilities across the country have been attacked and burned down in a wave of reprisal attacks. The police and the army have done nothing to protect them. Each day brings new horrors, nightmarish scenes Egyptians could never have imagined. Nuns paraded on the streets like “prisoners of war.” Urban warfare with hovering choppers kicking up dust. Citizens opening fire on one another. People jumping off bridges to avoid bullets, falling and crumpling to the floor motionless. The scale of human loss is staggering—and with both sides vowing to escalate, worse days surely lie ahead. Today, many of the revolutionaries who fought the country’s successive authoritarian regimes—first Mubarak, then the Supreme Council of Armed Forces, then the Muslim Brotherhood—now find themselves sitting on the sidelines, pushed out of the discourse and forced to watch as the bloodletting continues. The transformative revolutionary moment that exploded on January 25, 2011, has become a faint glimmer, in danger of being extinguished completely. “Despair is betrayal” is the mantra that has echoed throughout Egypt during the many tough times over the past two and half years. Today, it is very hard not to feel like a traitor.